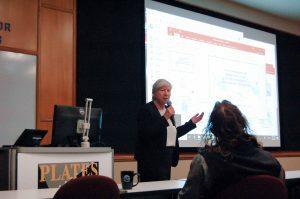 The PLATES program has marked a key milestone in the study of plate tectonics by holding a symposium to celebrate 30 years of PLATES at the University of Texas Institute for Geophysics (UTIG). The symposium, held March 25-26, brought together colleagues from across the world to reflect on some of the program’s key achievements, present new research and discuss the future of plate tectonics research. PLATES is an industry-funded project dedicated to the research of plate tectonics and geological reconstructions. The project studies evidence of how plates move around the Earth and creates accurate reconstructions of our planet’s continents changing over time. The animations, databases and tools created by the project have been used for diverse purposes, from oil and gas exploration to tracking animal migration in the Earth’s distant past. PLATES scientists include Lawrence Lawver, Ian Dalziel and Ian Norton. One such area is biology – in particular, evolutionary biology. Speaking on the morning of day one, Julia Clarke, Professor of Geological Sciences at the Jackson School of Geosciences, described how plate reconstructions are changing how we think about biodiversity dynamics and the origins of species. Sharon Mosher, Dean of the Jackson School of Geosciences, opens the second day of the symposium. Among other highlights, Professor of Geology and Geophysics at Caltech, Joann Stock, gave a compelling explanation for the origins of the Altiplano plateau, an unusually broad section of the central Andes. “I think Joann Stock did an excellent job of demonstrating one of the possibilities for the Altiplano uplift,” said Lawver. “She pointed out that the edges of the Manihiki Plateau were just sheared off and headed somewhere else.” Those edges formed microplates that may have ended up being dragged into the South American trench, choking it and forcing the uplift of the Altiplano. Other talks looked at recent applications of machine-learning in plate modeling, how new satellite data has improved plate reconstructions, whether plate tectonics is driving the global carbon cycle, and a lively debate on the role of paleomagnetism in understanding Earth evolution. Becker specified what that additional dimension could involve. “I think the future of PLATES has to involve an understanding of the dynamics of mantle convection and the transport of sediments and volatiles – and how that all factors into Earth evolution,” he explained. Whatever the future holds for plate tectonics research, Lawver believes that one of the big takeaways from the symposium was that advanced data processing techniques such as data mining and artificial intelligence will always depend on good science to reach the right conclusion.